WASHINGTON, D.C. -- With the Republican-controlled House of Representatives engaged in a tense, government-shuttering budgetary standoff against a Democratic president and Senate, the Republican Party is now viewed favorably by 28% of Americans, down from 38% in September. 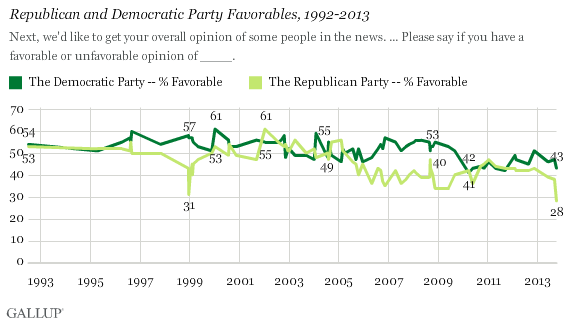 This is the lowest favorable rating measured for either party since Gallup began asking this question in 1992. The Democratic Party also has a public image problem -- although not on the same elephantine scale as that of the Republican Party -- with 43% viewing the Democratic Party favorably, down four percentage points from last month. These findings come from a Gallup poll conducted Oct. 3-6 that followed the Oct. 1 partial government shutdown after lawmakers in Washington were unable to pass a spending plan for the federal government. 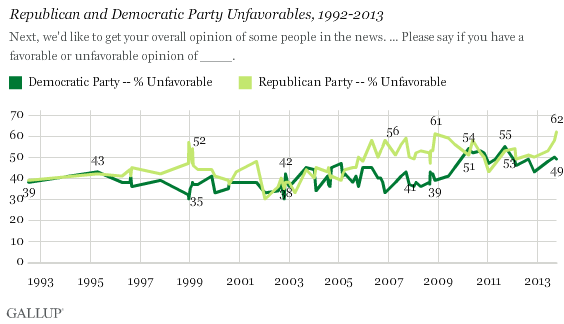 More than six in 10 Americans (62%) now view the GOP unfavorably, a record high. By comparison, nearly half of Americans (49%) view the Democratic Party unfavorably. Roughly one in four Americans see both parties unfavorably. Self-identified Republicans are more than twice as likely to view their own party unfavorably (27%) as Democrats are to see their own party unfavorably (13%). The GOP's unfavorable rating among Republicans is up eight points from September, compared with a one-point rise in Democratic Party unfavorables among Democrats. These findings may be consistent with the widely circulated narrative that the Republican Party is internally splintered on how best to handle the budgetary negotiations. Independents, meanwhile, remain unimpressed with both parties: Thirty-two percent view the Democratic Party favorably, while 27% view the Republican Party favorably. As the two major political parties are locked in a high-stakes political imbroglio that has resulted in a government shutdown and may cause the first-ever default on the national debt, Americans are more likely to view both parties negatively than positively. The Republican Party is clearly taking a bigger political hit from Americans thus far in the unfolding saga, with 28% rating the GOP favorably -- a loss of 10 points from only a month ago. This contrasts with previous Gallup findings from just before the government shutdown showing the Republican Party making up ground on a few key issues. Thus, the Republican Party's current strategy in the fiscal debates may not be paying dividends. For their part, the Democratic Party has also seen its favorability rating drop since September, though by a smaller four points. Moreover, both parties are down from where they were just after the 2012 elections, indicating the many political battles of 2013 have had a corrosive effect on the two parties' images. Results for this Gallup poll are based on telephone interviews conducted Oct. 3-6, 2013, on the Gallup Daily tracking survey, with a random sample of 1,028 adults, aged 18 and older, living in all 50 U.S. states and the District of Columbia.